These are SO GOOD. Trust me. Actually, don't trust me, make them and find out for yourself. I got this recipe, but it came from a lady I work with who didn't really want me to have it. I had her best friend get it and give it to me. Sneaky sneaky. So I'm going to post it all over the internets so that everyone can enjoy these wonderful Amish Cookies, because hogging your recipes is. not. cool. Haha, I'll show her. Now that you've had a heart attack by the sheer amount of crap you need for this, let me tell you how I do it. For the sake of time (sorry, I don't have twelve days to bake cookies, which is basically what her recipe would require), I cut it in half. Trust me, half of the recipe makes a ton of cookies, I've given them away to everyone. Cream together the vegetable oil, eggs, and sugar. In a big measuring cup, dissolve the baking soda into the buttermilk, and add the vanilla. Mix with the oil, eggs and sugar. In a separate bowl, combine the salt, baking powder, and flour. Add the flour mixture a little at a time until blended. I used my mixer for the first time on this recipe, and let me tell you, it made it a thousand times easier for me than it was to make these cookies without it. It can be done though, I did it last year. I've never made the whole batch at once, and honestly I can't figure out how she gets a bowl big enough for it. The half recipe filled my mixer bowl pretty full, and it's a huge bowl. They really are easy though. 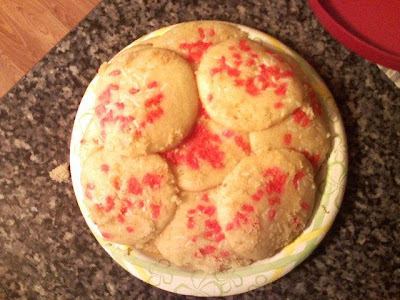 You can decorate them however you want, but if you're going to use sprinkles, put them on before they go in the oven. They're pretty spongy when they come out. I'm telling you, they're so good you won't be able to breathe. Honest.